Waltzing Regitze, also known as Memories of a Marriage, (Original title: Dansen med Regitze) is a 1989 Danish drama film directed by Kaspar Rostrup. Based upon a popular Danish novel by Martha Christensen, the film is an unsentimental portrait of the history and changes of a middle-aged couple's marriage, told through flashbacks during a summer party. The film stars Ghita Nørby and Frits Helmuth. 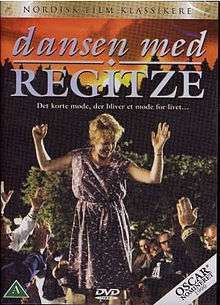 Waltzing Regitze was nominated for the Academy Award for Best Foreign Language Film. In 1990, it won the Robert Award for Film of the Year and swept the Bodil Awards, winning Best Danish Film as well as all four of acting categories.